Please provide your name and email and we will tailor to your personal tastes. Plus, just by being in our mailing list you automatically have a chance to win $100 Brinker's Jewelers gift card every month. 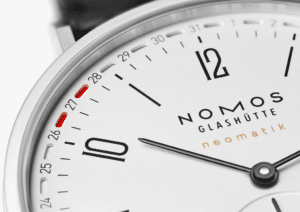 NOMOS joined the world of fine watchmaking in the 1990s and have continued to grow steadily in the decades since. Positioned at the crossroads of quality and value, their reputation for solid construction has helped them develop deep roots in Germany that now stretch across oceans and countries. We love their passion for quality and attention to detail, so we’re bringing them straight to you. Designed to go as fast and far as you’d like to take it, this watch boasts superluminova fields on its dial to display the time after-hours. It’s water resistant in depths of up to 100 meters and features a generous three-lane date window. 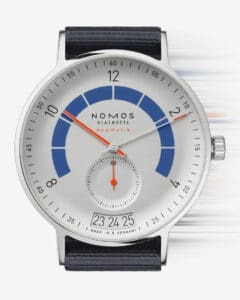 The handsome, pared-down design expected of NOMOS is evident across all three Autobahn models. 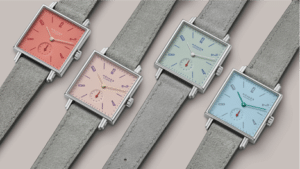 As part of a limited release, NOMOS has reimagined the Tetra into colors that playfully nod at a sweet tooth. Pulling inspiration from pomegranates and pastries, this classically crafted collection offers subtle pastels that are muted to flatter any skin tone. We found them each to be elegant and still fitting for everyday wear. The velour leather strap provides balance and texture you must see in person to fully appreciate. Did we mention it comes with the optional upgrade of a sapphire crystal glass back? We’d be delighted to show you. 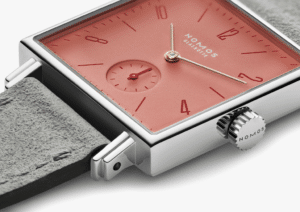 As the flagship NOMOS watch, the Tangente remains an archetype for the brand. 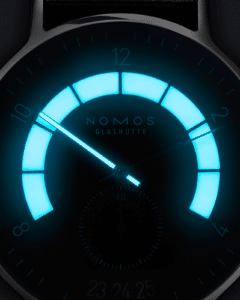 Since the initial release 26 years ago, NOMOS has rolled out artful enhancements in multiple waves. The latest release in the Tangente collection was on full display at Baselworld 2018. 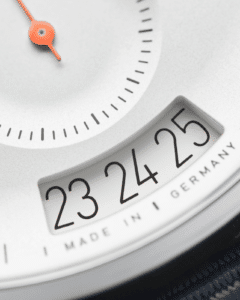 In the Tangente Neomatik 41 Update, the original design remains almost untouched with the exception of one unique element. Aside from growing in size, it’s also grown in functionality. The designers have managed to push the date indication to a ring surrounding the dial. The resulting minimalistic symmetry is highlighted by pops of red that are at once striking and delicate. The day of the month, from the first to the 31st, progresses around the edge of the dial. The current day is flanked in red dashes—a setting that can smoothly be adjusted in either direction by turning the crown. This piece is uncomplicated, classic, and eye-catching. 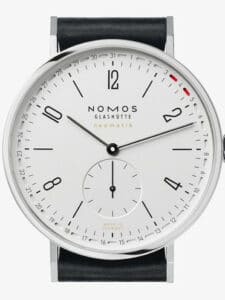 The distinction of a NOMOS watch is clear when you see it. Drawing an impressive balance between simplistic wearability and ageless style, the NOMOS team successfully communicates their unmistakable aesthetic year after year. Do you have questions about any of the new models? Our Watch Specialists are ready to guide the way.